Growing up like a bow hunter, You know how important it is to have a solid bow. Now that your kids are following in your footsteps you want to make sure that they have the best youth compound bow on the market. But with so many options to choose from, it can be hard to know which bow is the best bow for your son or daughter. We have compiled some of the top rated youth compound bows reviews for you. From Diamond Atomic to Bear Archery we will tell you what makes them great, and what you may want to avoid as you select the perfect bow for your kids. How to find the best youth compound bow for your child’s age and size. The Vortex is a bow that can grow with your kids; it has draw weights from 16lbs up to 45lbs. With easy to adjust draws your kids can have hours of fun learning how to become an experienced archer. 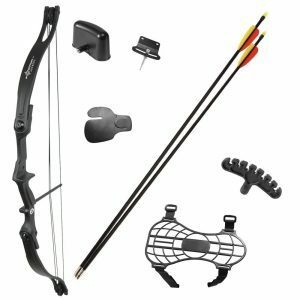 It comes with 3 arrows and a bow holder (Quiver) and sight Although most customers love the bow, there are concerns with the arrows, as they may bend or shatter easily. The sights can also fall off easily, so you may want to look at other options for both arrows and sites. Final Verdict: This product is a good option for kids that are just learning archery, it is also affordable, so if your kid gets bored easily you won’t have a huge equipment cost. It also has a five-year warranty, so should something not work, you know you are covered. it can best youth bow compound for 12 years old or more than that. This product can be set to weights up to 45lbs, which allows it to be used for several years as your child grows. Genesis youth compound bow is for younger kids those are just getting started. the riser of the bow is made up of aluminum and every component has amazing build quality as well as it comes with lots of accessories like Quiver, Arm Guard, ALuminum arrows and hex wrench. This bow is not for older or advanced users, but if you are introducing kids that are 4-7 years old this is a solid product that can get them off to a great start. With a zero let-off feature, it makes shooting easy. The kit comes with the bow, belt tube quiver, adjustable arm guard and five aluminum arrows. Final Verdict: If you want to introduce young children to archery, this is the bow to buy. It is one of the best youth compound bows for ten-year-old on the market. It can have your first grader mastering basic shooting skills that can set them on a lifelong love of archery. Is very lightweight so as your kid’s age, you will need to replace it. Bear Archery is an old, reliable institution, operating in the U.S for the last 80 years. They are renowned for making the most exceptional bow sets. The Bear Archery Brave Bow is one such high quality and durable bow. It serves perfectly as an introductory bow for young children, allowing them to practice on a fully functional smaller bow. The best part is that the bow is two-wheeled which makes the transition to an Adult Compound bow easier. The draw weight of this bow is about 15 to 25 lb. while the draw length range is about 13.5 inches which is perfect for young children who cannot put in too much force. The bow itself is extremely lightweight, weighing merely 2 lbs. The brace height of the Bow is about 5.5” while the overall length is about 26”. This makes it easier for smaller kids to use it without getting overwhelmed. The let-off is 65%. 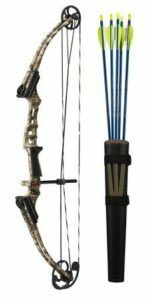 The bow includes a Whisker Biscuit, armguard, 1-pin sight, arrow quiver, finger rollers as well as two Safety glass arrows. However, a potential drawback is that it is only right hand oriented. The Brave Youth Bow is available in six different colors. Also included is a 90-day limited warranty so you can rest assured your investment is safe! Low draw weight 15-25 lbs. Easier to use for children. Brace height of about 5.5”. Includes a Whisker Biscuit which makes it easier to shoot arrows. Includes a quiver as well as two Safety glass arrows. Draw length can be too short for older kids. All in all, the Brave Bow Set is perfect for young children who aspire to become great archers. The bow is easy to use and will ensure your kids have a lot of fun along the way! The Crosman Elkhorn is a sturdy and well-made bow intended to be used as an introductory bow for children 7 to 10 years old. Its body is made of composite fiber which is extremely light while the limbs are made from a more durable composite fiber. The lightweight body of the Crosman weighs about 1 lb. 12 oz. which is perfect for small kids to handle. The axle to axle length of the bow is about 33 inches. The draw weight is about 15 lbs. while the draw length is up to 26 inches. The draw height and the draw length is not adjustable which is a big disadvantage for this bow. The brace height is about 8 inches with a let off of 65%. These specifications make it easier for kids to shoot arrows. Th velocity is a low 70fps which are excellent since you would not want your kids running around with a bow that can shoot at 300 fps. Included in the package are 2 composite arrows, a two-piece quiver, a finger tab, an armguard as well as a single pin sight. The Crosman comes with a 90-day limited warranty! An adequate velocity of 70 fps. Includes an arm guard and a finger tab to ensure your child never gets tired. Non-adjustable draw length and draw weight. The Crsoman Elkhorn Jr. Compound Bow will surely be loved by your kids as it is extremely easy to use. It will bring all their fantasies of becoming an archer to a groundbreaking reality! When it comes to youngsters, they need a bow with just the perfect amount of draw weight and draw length. This makes it harder to find the perfect youth bow for your kid. However, the Barnett Youth Archery Tomcat 2 is sure to leave your kids surprised! This adjustable bow makes it easier to customize according to your kid’s strength. It serves well for beginners and functions just like a real bow so your kids can enjoy the illusion of being real archers! The draw weight of the Tomcat is 17-22 lbs with an adjustable draw length of about 20-22 inches. The bow itself is about 3 lbs which are quite manageable for most young kids. The axle to axle length varies from 26″- 28″ while the overall length is around 35″. The brace height is about 6.75” with a 60-70% let-off. Included is a detachable quiver, two arrows, and soft touch finger rollers. The soft touch rollers ensure your kid’s fingers never get sore and so he can have fun all day long! Also included is a 3 pin fiber optic “BrightGlo” sight which is excellent for starters. The sight is adjustable as well. Available in a boy’s version and a girl’s version where the only difference is the color of the bow. Suitable draw weight of 17-22 lbs. Only suited for right-handed folks. The arrows are of low quality. 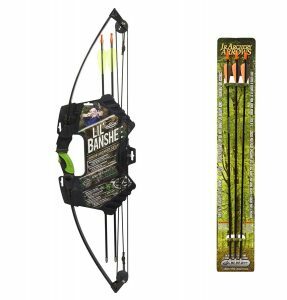 The Barnett Youth Archery Tomcat 2 is the perfect bow for kids 8-10 years old. It is easy to use with a lower draw weight and draw length. It is durable and ensures your kids have fun all day long! Perfect for those wanna-be KatnissEverdeens and Hawkeyes! This bow is an excellent option for kids that are just getting started; it has a soft touch that can make it easier for kids to use. With easy draw weights and lengths, it can be a good solution for younger users. And as they grow it can grow with them, as the draw lengths and weights can be adjusted to longer lengths. It comes with a 3-pin fiber optic sight, two arrows, and soft touch finger rollers. While the price is low, that also means it doesn’t have all of the features that other options include. It is also better for kids between 5-9 as the bow isn’t that powerful. The arrows also have trouble sticking to the target due to lower power level. Final Verdict: This is truly a starter compound bow; it is not designed for kids that already have archery experience. The arrows that are provided with the bow aren’t the greatest quality, so I would recommend for kids that are new to archery. It is a solid bow to learn with. The Diamond Atomic package is a solid choice for first-time shooters. The bow offers a durable right-handed option that can take a beating. It is a very forgiving bow that is easy to adjust. The Atomic youth bow has unexpected speak and is one of the most accurate children bows on the market. If you have a child who is just getting started, this is a bow that can build confidence while still be forgiving. While this is a great bow for younger children, it doesn’t grow with your child. It also has some minor issues with the string; it comes off easily which can frustrate newcomers to the sport. Final Verdict: This compound bow arrives with everything you need to get your child started. It’s a well-constructed bow that is designed to look real, which makes it an appealing option for your kids. It is easy to adjust and draw which will allow your child to start enjoying it right from the start. Best youth compound bow for 10 years old. The Apprentice 3 is a compound bow that is designed to be ready for your child’s first hunt. Designed to deliver ease and accuracy it has an adjustable draw length that allows you to draw from 15 to 60lbs. With new string suppression and smooth two-cam system, this youth compound bow is something that your kids can use every season. It comes complete and ready to use. It is easy for your child to use, and it can grow with them. 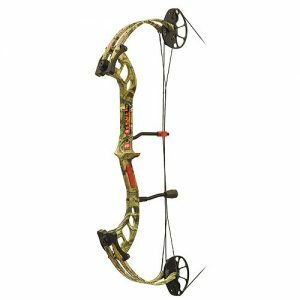 It is a best youth compound bow for hunting that comes with all the accessories you need to get your kids off and to hunt. However, the slide type cable guard isn’t as smooth as the roller guard option. Final verdict: this is one of the best youth compound bows on the market, it comes with everything your child could need. It has a solid cam system, and the arrow provided are designed to stick to a target or to be used during a hunt. Comes with all needed accessories and is ready to use. The third generation cam system is good throughout and works well. It is easy to use and can grow with your child. It comes ready to use, and the included arrows are designed for hunting. The slide type cable isn’t as smooth as the roller guide. It can be too heavy for younger children. Another bow from Barnett, the Lil Banshee Jr. Compound Set offers the most ideal solution for introducing young children to archery. It comes pre-assembled and ready-to-shoot. Perhaps one of the most exclusive features is that it is usable for left-handed folks as well as right-handed ones. This ambidexterity in shooting already makes this bow a winner. The draw weight of this bow is 18 lbs. while the draw length is about 18 to 22 inches. The net weight of the model is about 1.8 lbs, which is perfect for small children. The overall length of the bow is 33.5 inches. Note that the draw weight is not adjustable which is a huge drawback. The Youth Archery Set includes 2 arrows, finger rollers to combat any finger soreness, an adjustable pin sight, and a carry-case. The body of the compound bow has a soft touch grip which ensures your fingers don’t slip. The Barnett Lil Banshee Jr. is available in 3 different colors, including Black, Camouflage Tree, and Black. Also included is a five-year limited manufacturer’s warranty which ensures you can get any damages or defects repaired without it costing any money. Perfect for use by both left-handed and right-handed users. Nonslip body with a soft touch grip. To convert from right handed to left handed, you have to get it done from a professional shop. The Jr. Compound Archery Set by Barnett is the ideal set for youngsters who have caught the bug for archery! The 5-year warranty and ambidexterity is an added plus! The PSE is a well-known brand in America, popular for their high precision bows. PSE stands from Precision Shooting Equipment which is exactly what the Youth Heritage Compound Bow Set is! It is perfect for young children 10 years or older. It is very well-made and quite sturdy due to its composite fiber composition. The axle to axle length of the bow is about 25.25 inches. The draw weight of the youth bow is 12-29 lbs. while the draw length is 16.5-26 inches. Both these factors are easily adjustable through screws. The weight of the bow itself is about 2 lbs. The package includes an arm guard, quiver, 2 fiberglass arrows, 3 finger rollers, pin sight and an arrow rest. The brace height is about 7 inches while the let-off is 0%. This is perfect as it relieves a lot of tension and ensures your kid’s arms do not get tired easily. The bow is intended to be used by the right hand. Also included is a limited lifetime warranty which is unheard of in other companies! This ensures you can get the bow fixed for free in case of any errors in the workmanship of the bow. Made of durable compostie material. Includes, armguard, finger rollers and pin sight. Can only be used by right-handed folks. The arrow rest is not of high quality. The PSE Youth Heritage Archery Set is perfect for those young archers who are just seeking out their true calling. This bow will set the foundation right and will help them learn and grow into better archers! The PSE Fever is for all those youngsters with a raging archery fever! It is perfect for kids a bit older than 10 as it has a high velocity. This makes it ideal for bowhunting and bow fishing. The best part is that it comes in two forms: right handed and left handed ensuring inclusivity. The innovative new technologies such as advanced split limb and the advanced cam ensure top shooting speeds of 304 fps. The bow is a bit on the heavy side weighing about 4.713 lbs. The axle to axle length is 32 inches. The 70% let off as well as the 6.375-inch brace height ensures easier nocking of arrows. The bow is highly adjustable with draw lengths ranging from 11″ to 29″. The bow is available in a diverse range of draw weights including 29 lbs,40lbs, 50 lbs, and 60 lbs. Included in the package is a Gemini Sight, Whisker Biscuit Rest, Hunter Quiver, Peep Wheel and Nock Set. This wide range of accessories makes it easier to aim and shoot comfortably and easily. The PSE Fever is available in a wide variety of colors including black, country, white, and lime green. The bow comes with a Raptor Grip and a String Stop String Suppressor which aid the youngsters in gripping the bow without slippage. A high speed of 304 fps. Perfect for bowhunting and bow fishing. Available in a diverse range of draw weights. Includes sight, arrow rest, quiver, wheel and nock set. Available for both right handed and left handed individuals. The PSE fever is perfect for those kids who want to get a taste of bowhunting at a younger age. However, due to the high velocity of the bow, adult supervision is highly recommended! Now that we know what bows may be best for your child, we should also determine which option will work best for you based on age, bow weight, draw weight, draw length and price. Understanding that will work best for your kids can turn them into lifetime archery fans. Kids as young as three can start learning basic archery skills, with bows like the Genesis even preschool kids can have a bow they can use. Archery can also teach your child’s hand-eye coordination and the importance of being safe around other archers. For children between the ages of 5 and under you may want to look for bows that don’t exceed three pounds. Older kids can manage slightly heavier bows, but you still want to keep the average weight below five pounds. For younger kids, you want to keep the draw length around 14”-24” until they are around ten years of age. You should always keep the draw length that ranges if your child is smaller than average. You want to find a bow that is comfortable, and that your child can easily use. While focusing on weight and age is important, you should always include your child’s input as well. Your budget can also be a driver of how you choose a youth compound bow for your kids. If you are on a budget, the Barnett Tomcat is a good option. The Bear Archery Brave and Warrior 3 are also budget-friendly bows that can provide a quality bow for your child. If you have more to invest, then bows like the Diamond Atomic, Bear Apprentice 3 and Mathews Genesis Mini are great options for both starters and experienced kids alike. Introducing your kids to compound bows can help instill discipline and respect that will extend beyond the hunt. When you teach your kids to respect nature and one it can help them become well-rounded adults. Archery is a great way to help your kids build confidence, so whether you want them to try something new or you want them to follow in your footsteps, teaching them how to use a youth compound bow is a great way to start.